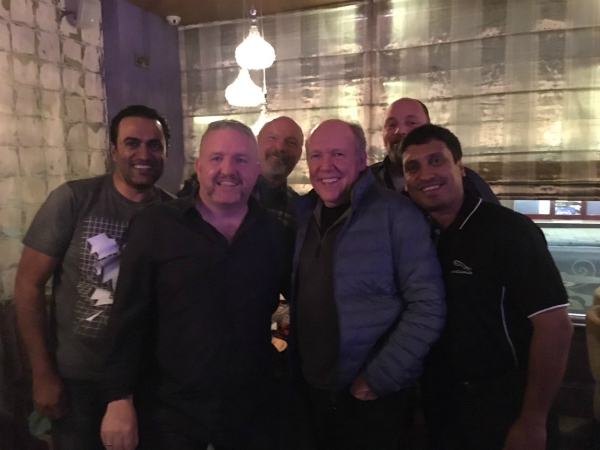 Five in-market trainers received a quite a surprise when they bumped into Ian Callum, Jaguar Design Director, at a Kenilworth restaurant following the Global Technician of the Year awards. The group was sat having a well-earned meal while discussing how the night had gone, when Ian, who was eating in the same restaurant, spotted them in their JLR-branded polo shirts and went over to say hello. Overwhelmed at first, the five trainers, representing markets from all over the world, were soon chatting enthusiastically about their passion for the brand with an equally fascinated Ian, who was keen to know what they had been up to. Our Global Network Learning and Development team, who hosted the event in order to promote reward and recognition within the JLR retail network, were understandably delighted to see the photo of the group that was taken during the meal (see gallery). Pictured left to right: Farid Shaikh – MENA; Kenneth Flynn – Ireland; Laszlo Stankovics – US; Ian Callum - Jaguar Design Director; Albert Frische – Germany; Anand Desai – India. You can watch highlights from the Global Technician of the Year awards below.